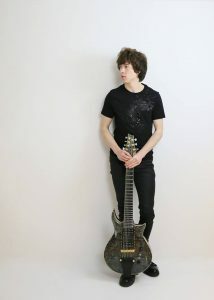 Christian Vegh has been referred to as a “young guitar prodigy with an old soul” the “type of young artist that will shape Canadian music for the next 50 years” and the “hottest young guitar player in the nation”. Christian Vegh was awarded the 2016 “Charles McDaniel Award” from the American & Canadian Federation of Musicians. This award is given out every 3 years to a musician 16–35 yrs. and is awarded for Diversity, Creativity, Innovation & Excellence in Music. He was presented the award & scholarship at the 100th Convention of the American Federation of Musicians in Las Vegas. Vegh was also named to the “Brotherhood of the Guitar” in 2016, which recognizes the top 16 guitarists Internationally (21yrs. & under), sponsored by Ernie Ball Guitars, Music Man and Guitar Center. He was honored to have a video and photo shoot in Las Vegas with famed Rock and Roll photographer Robert Knight for this award. Christian also received the 2016 Biz X International Magazine “Artist of the Year” award. He was also a semi-finalist in the worldwide International Songwriting Competition. “ISC has the most prestigious panel of judges of all the songwriting and music contests in the world”. Christian was chosen in three categories for Blues and Unsigned for “Chains in Mind” and Instrumental “The Farm”. Christian plays his Signature Windsor-CV 7-string hollow body.